Make the vinaigrette: combine the cider vinegar, water, lemon juice, honey, thyme, salt and pepper in a small bowl – whisk to combine. Slowly add the olive oil, whisking constantly (to prevent the vinaigrette from “breaking”). Once the vinaigrette is ready, set aside. (Note – can be made one day ahead; refrigerate). Prepare the salad: Place the dried cranberries into a small glass bowl, and set aside. Bring a medium pot of water (about 2 cups worth) to a boil – once boiling, pour a small amount of the water into the cranberry bowl, until they are completely covered. Return the remaining water to the heat, and lower to a simmer. Place a steamer basket into the pot, and arrange the kale leaves in the basket. Cover, and allow to steam until the leaves are just wilted – about 7 to 9 minutes (alternately, you can steam the kale in the microwave). Once done, remove the kale and rinse briefly under cold water to stop the cooking process. 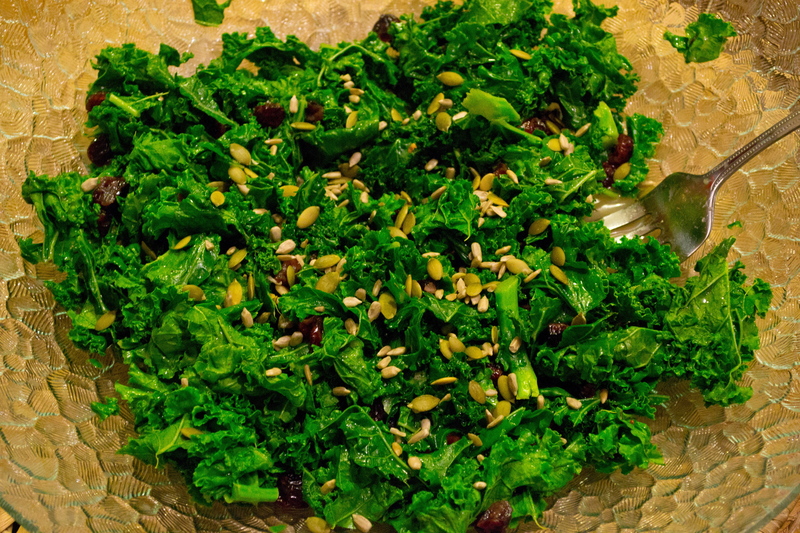 Drain the kale, and place into a large salad bowl. Add 2 tablespoons of the cranberry soaking water to the vinaigrette, then drain the cranberries and add to the kale – toss with the vinaigrette, and top with seeds of choice. Enjoy!